Policies are arising around the world, most recently in the United States, that mandate the implementation of marine spatial planning as a practical pathway towards ecosystem-based management. In the new United States ocean policy, and several other cases around the globe, ecosystem services are at the core of marine spatial planning, but there is little guidance on how ecosystem services should be measured, making it hard to implement this new approach. A new framework is shown here for practical, rigorous ecosystem service measurement that highlights contributions from both natural and social systems. 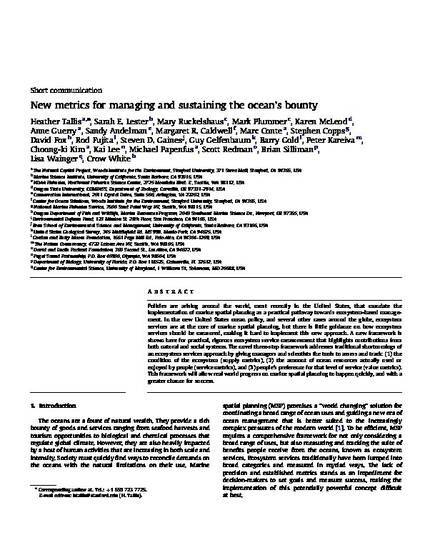 The novel three-step framework addresses traditional shortcomings of an ecosystem services approach by giving managers and scientists the tools to assess and track: (1) the condition of the ecosystem (supply metrics), (2) the amount of ocean resources actually used or enjoyed by people (service metrics), and (3) people's preference for that level of service (value metrics). This framework will allow real world progress on marine spatial planning to happen quickly, and with a greater chance for success.